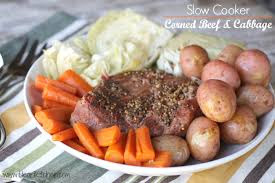 This is an awesome 1 pot meat that the whole family will love! It’s also super simple and healthy and you can put it on in the morning and forget about it until dinner time. It’s also wonderful for leftovers! Slice Onion and quarter potatoes and put in bottom of a slow cooker along with the baby carrots. Take water and add the garlic, sugar, cider, spice packet and bay leaf and pour over. Slice cabbage and half brisket and add on top. Cook on low for 8-9 hours or until thoroughly cooked. Discard bay leaf. Add salt and pepper to taste.